Tropical forests are an undervalued asset in meeting two of the greatest challenges of our time—averting catastrophic climate change and achieving development goals. The good news is that the science, the economics, and the politics are aligned to support a major international effort to reverse tropical deforestation. Frances Seymour and I will be discussing this on Friday, October 10, at an event previewing findings from our forthcoming book, Why Forests? Why Now? Register here to attend. Why Forests? Why Now? draws on the findings of some 20 peer-reviewed working papers. I describe the working paper by Prof. Katrina Mullan on the economics of forests here; below I describe the findings of Prof. Katrina Brandon’s working paper on the science. I hope you can join our full discussion at this Friday’s event. Now imagine instead a rainstorm falling on a deforested tropical hillside. The absence of shade and moisture has made the land hot and dry. The raindrops strike forcefully on bare ground, leading to gullying and ever-greater erosion. With little vegetation to shield the soil and hold it in place, landslides strike, damaging roads and houses below. Because there are no trees to pump water into the ground or sky, more water runs off immediately, and less is stored for later. Rivers flood and overflow their banks, then run dry. When the river flows out from the intact forest, it is largely free of sediment and has been cleaned of pollution. Microbes in the forest soil have biochemically transformed contaminants. This clean water can be used for irrigation, cooking, and cleaning, leading to better food and better health. The river flowing from the tropical forest makes ideal habitat for freshwater fish. There are more species of fish in the Amazon Basin than in the entire Atlantic Ocean. These freshwater fish provide the greatest share of animal protein for many poor people in tropical countries. Forests support freshwater fisheries by cooling river temperatures and providing fish with food in the forms of leaf litter, fruits, and seeds. Seasonally flooded forests are particularly important nurseries and breeding grounds for fish. In contrast, the river flowing out from the deforested landscape has more pollutants and more sediment. Sediment, in turn, reduces reservoir capacity behind hydroelectric dams, wears down turbine blades in dams, and damages inland fisheries. The river continues through a landscape of fields and forests. These forests, to those who know them, are a free medicine cabinet. 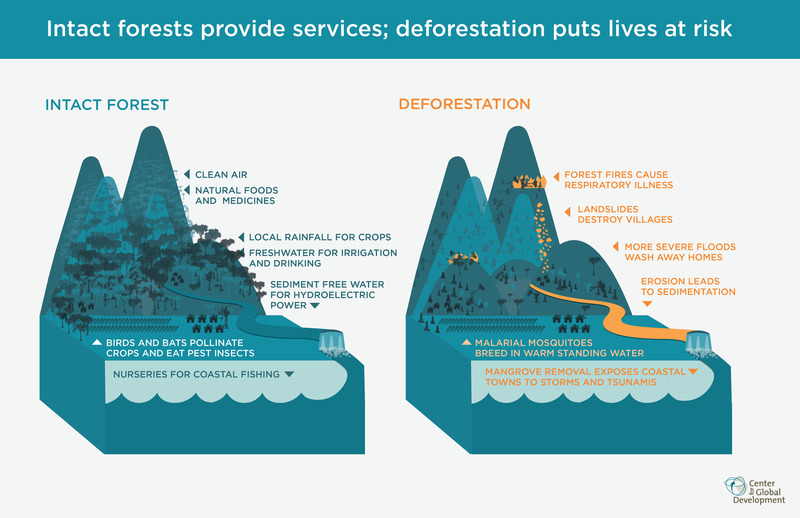 Tropical forests provide habitat for two-thirds of all known land-based species. There are more bird species living in Bolivia’s New Jersey-sized Madidi National Park than there are living in the entire United States. These plants and animals come in a riotous array of biological diversity. Tropical forest species have evolved to produce chemicals to attract mates or lure pollinators, deadly poisons and neurotoxins to deter predators, antibiotics to ward off diseases, coagulants to stop leaking sap, and even compounds to regenerate limbs. Thus it should be no surprise that so many traditional medicines can be found in tropical forests, and that so many modern pharmaceuticals are derived from these compounds. Tropical forests are a free grocery store as well. They are a source of nuts, fruits, vegetables, mushrooms, fish, and bushmeat, as well as fuelwood and charcoal for cooking. A more varied diet is a more nutritious diet. Tropical forests not only provide food directly; they also provide free inputs to nearby farms. As mentioned above, forests function like an air conditioner and sprinkler system for downwind farms. Forests can also retain water which they slowly release during the dry season when it is most highly valued. Farms further benefit from the birds and bats living in tropical forests, which pollinate crops and eat pest insects. Deforestation, on the other hand, poses threats to health. Intact rainforests rarely burn, due to their high moisture content and their high ratio of leaves to wood. When forest fires do occur, they are small, slow-moving, and usually extinguished at night when moisture levels rise. But forest clearing and fragmentation caused by deforestation makes rainforests more susceptible to drying and drought, leading to increased frequency and severity of fires. Many forest fires are set deliberately as well. Forest fires release heavy metals, carcinogens, and particulates, which can carry long distances and have severe health effects. Air pollution from forest fires is responsible for hundreds of thousands of early deaths from respiratory ailments worldwide annually. Deforestation can also lead to an increase in disease-carrying mosquitoes. Intact forests contain a higher number of insectivorous birds and bats that eat mosquitoes, and their cooler temperatures slow the rate at which mosquitos mature, compared to disturbed areas. Deforestation can enhance the conditions for malaria, with small pools of standing water and warmer temperatures leading to faster larval growth. When the river finally reaches the sea, it meets the partially submerged coastal mangrove forests. Mangroves trap and bury large amounts of carbon, not only from their own leaf litter, but also from organic matter that has flowed downriver from inland. Mangrove forests bury carbon so effectively that they build out shorelines and raise the elevation of the coast. Mangroves also protect coastlines from high waves, storms, and tsunamis. Mangroves play a critical role as breeding grounds and nurseries for coastal fish. Their many tangled roots provide a refuge for small fish and crustaceans from larger predators. It has been estimated that up to 80 percent of global fish catches depend on mangroves in some way. When mangrove forests are cleared, coastal communities are left more exposed to storms and tsunamis, and the productivity of coastal and marine fisheries are depleted. Of course, as Brandon’s paper details, there is a wide variation in when, where, how, and in what quantity the services described above are provided. Not all of these effects occur everywhere all of the time, but all happen somewhere at least some of the time. For some of these effects the mechanisms have been well understood for decades; other effects are new and intriguing, and the subject of as-yet-unresolved scientific debates. It is natural to wonder, if tropical forests provide so many important services, why they continue to be cleared so rapidly. The answer is that the services described above are public, accruing freely to everyone downstream or downwind. Meanwhile the benefits of cattle pastures that clear rainforests, or shrimp farms that displace mangroves, are private. It would be a far, far better thing to set up financial transfer mechanisms so that land-use decision-makers can internalize a share of the public value their forests provide. This is the goal of payments for ecosystem services (PES) systems at the regional level, and performance-based payments for forests’ carbon storage services (REDD+) at the international level.